Jelling Mounds, Runic Stones and Church are outstanding examples of the pagan Nordic culture and its transition into Christianity. They were created as a royal monument in the 10th century. 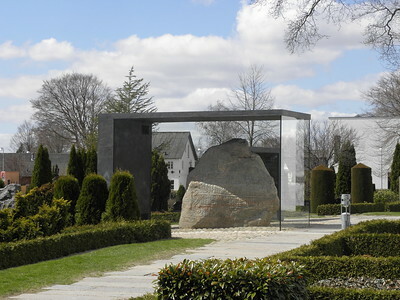 The site symbolizes the creation of a unified Denmark and the introduction of Christianity there. 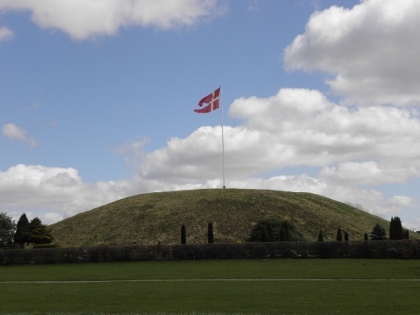 The burial mounds are said to have been those of King Gorm of Denmark and his wife Thyra, the parents of King Harald of Denmark. Yet archaeological excavations and research shows that only the North mound contains a burial chamber. It is plausible that this chamber once held the bones of Gorm the Old, bones that later has been found underneath what is now Jelling Church. "King Haraldr ordered this monument made in memory of Gormr, his father, and in memory of Thyrvé, his mother; that Haraldr who won for himself all of Denmark and Norway and made the Danes Christian." As the other posters all added a photo of the larger rune stone with their story, I'll try to show more of what the site in general looks like. In 2013, the central area of the town of Jelling is a kind of park. The flashy white church is the focal point, with well-tended gardens and cemetery. Both rune stones stand next to the church in the yard. Since 2011 they are covered with a glass cage each. On either side of the church is a burial mound, overgrown by grass. The photos below dating from 2005 and 2006 show the main rune stone. I might be mistaken, but I believe that the engravings are much less visible now. 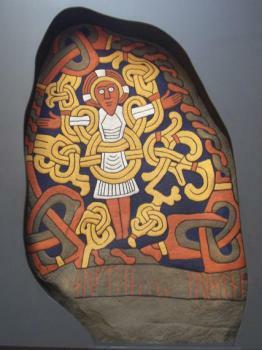 For example in the reconstructed rune stone at the exhibition center across the street, the face of Christ stands out. On site, that feature is hardly visible. I even went back for a second time to check after I had seen the reconstruction. The stones did not leave much of an impression with me, I even prefer the ones scattered around in the fields of Hovgarden. In all, I spent about 45 minutes here. I went to the top of one of the burial mounds, visited the nice exhibition center and had a look at the interior of the church. 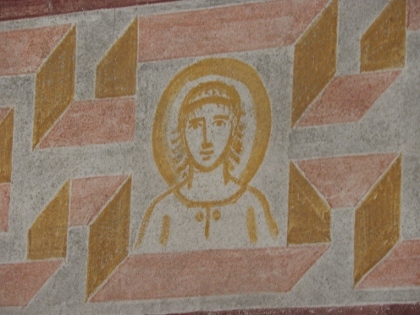 The originality of the church is somewhat of an enigma, although it is applauded in the AB evaluation for its mural paintings from around 1100. The town of Jelling lies quite deep into the Danish countryside. I parked at a supermarket that opens 7 days a week, something that would be seldom seen in rural Germany or Holland. It provided me with items for lunch, and across the street there's an ATM to get some Danish kroner (no Euro's here). At the site there were some 30 other visitors, mostly families with children. I visited this WHS in July 2016. I drove from Christiansfeld and slept nearby in a small town close to Veyle. This turned out to be a wise decision. After a couple of narrow country roads with very slippery gravel on the sides, I managed to arrive safely in Jelling and I parked my car for free close to one of the mounds. From here I headed straight to Kongernes Jelling - Home of the Viking Kings Experience Centre as I knew it's only open till 5pm daily (except Wednesdays till 8pm). Its name truly lives up to any expectation - it will be an informative experience and will give you enough background information and context to better appreciate the runic stones and mounds. 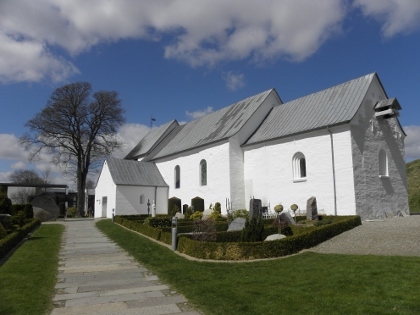 Moreover, the entrance is free so I'd recommend to start your visit here and then proceeding to the Jelling church and cemetery (open till 8pm). The rest is open 24/7 even though the runic stones are in glass enclosures. I spent an hour in the museum before heading outside to explore the site itself. Without the experience center I wouldn't have appreciated this WHS in the same way I did thanks to my visit and above all I would not have followed the centre's tip to view the runic stones at night (which I did later!). The highlight of the museum is perhaps the Jelling Cup which was found in the North Mound. I could enjoy a virtual drone view over the mound just opposite the museum as well as a panoramic view from the terrace. I also got a full body scan and incineration simulation to supposedly reach Valhalla. The interactive runic stones on screen give you an idea of how the stones must have looked like when they were painted. The stones' journey to Jelling is also worthwhile to fully appreciate the OUV of Denmark's first inscribed WHS. There's a very bad replica of the Harald stone just behind the museum while a photo inside the museum shows a much better painted replica which was placed at the National Museum of Denmark in Copenhagen. The UNESCO certificate of inscription is inside the Jelling Church just next to the runic stones. There are some interesting geometric murals but clearly this is not why this site is a WHS. 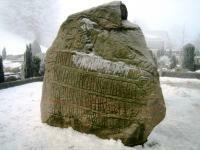 The Harald Bluetooth Runic Stone is perhaps the best example of a runestone worldwide. It has 3 intricately carved sides, one side contains what has been described as Denmark's christening certificate, one side contains an engraving of a dragon or serpent and one side supposedly has the image of Christ on it. Studies have shown that there are significant cracks in this stone and mostly because of natural weathering but also because of an act of vandalism in the past, the rune stones now stand in separate glass enclosures. This means that it is quite difficult to appreciate all 3 sides at daylight, partly because of the reflection and shadows caused by visitors and partly because the engravings have eroded quite a lot (especially the side with the image of Christ). The image of the serpent or dragon is in the best condition of the 3 and is best viewed in the afternoon sunlight. Different theories suggest that this dragon is a fabulous Norse animal, the Midgard serpent, the serpent from the Garden of Eden or more convincingly the lion of St Mark. It is facing the side on which Christ is portrayed with outstretched arms. These engravings resemble a story in a book, in which two pages meet. Around 1000 years ago pressure from the Holy Roman Emperor was significant and eventually tales of forced conversion reached Jelling too. The inscription states something along the lines of "I, Harald, made the Danes Christian!" even though in reality this conversion took a long time to take place. I could not see the engraving of Christ because of its erosion and because of the poor lighting so after climbing both mounds and strolling round the site perimeter, I had dinner at my hotel. After that I plucked a bit of courage and drove back the pitch black narrow roads to the Jelling Mounds to view the lit up runic stones at night just before complete darkness around 11pm. It felt quite spooky to be alone till midnight in the middle of a Scandinavian cemetery but the experience was totally worth it. All the runic stone engravings were visible and I could appreciate them better and take photos. If you have the time, I'd highly recommend visiting at night to round up your visit of one of the best WHS Denmark has on offer. The site of the Jelling Mounds, in central Jutland (the peninsular on which much of Denmark – but not its capital – is situated), was a sacred area for the Viking King Gorm the Old. I went there in March 2015. The father of Harald Bluetooth, Gorm reigned from AD 936 to 958. He was the last of the pagan Viking kings, because his son Harald took the step of introducing Christianity into Denmark. To my mind the most significant element of this WHS is the carving on the rune stone below of Christ on the cross. The significance derives from the fact that it is the earliest representation of Christ in all of Scandinavia, and it serves as a marker for the region’s transition from Viking paganism to Christianity. It is pretty hard to make out, but trust me it’s there. 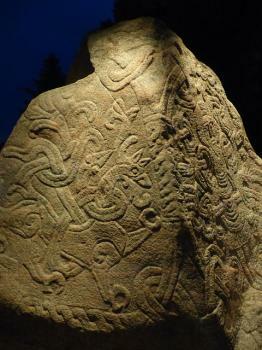 The two rune stones were primarily carved as memorials to Harald’s father (Gorm) and to his wife. They stand in glass cases to protect them from the weather, but you can walk all around them and see them from any angle. Certainly not one of the more interesting WHSs, Jelling nonetheless has a quiet charm. We had driven up from the Danish element of the Wadden Sea - but, annoyingly - missed out what was soon to become the WHS at Christiansfeld, on our way back to Billund Airport. This is a really small site in the middle of Jutland that doesn't offer a whole lot to see, but is still historically interesting. It consists of 2 runestones (under glass cover), 2 burial mounds, and a church. It is considered to be the cradle of Denmark, as the runestones mention the achievements of King Harold Bluetooth, who introduced Christianity to the country. It thus marks an important point in Scandinavian history - the transition from the pagan Viking Age to the Christian Middle Ages. You can see the church (not a lot inside, just some restored frescoes) and the runestones, and climb up the 2 mounds, in about 10 minutes. Thankfully, there is a rather interesting and modern museum (with free access!) only a few steps away. The information there is really well presented and covers every aspect of the site. It is only a short walk from a train station providing connections to the nearby town of Vejle. There also some direct trains to Copenhagen, so a day trip from there to Jelling is easily possible. There is not much more I can add to the reviews already posted here. Jelling is a small village and the mounds sit right in its centre. In between the two mounds are a church and the two stones. The church unfortunately was closed for a funeral so 10 minutes after arriving I had climbed the two mounds and looked at the stones and was left wondering what else I could do. Fortunately the free museum was open, and this was superb. It really explained the significance of the site, and also helped decipher the stones for me. There were castings of the stones that were painted in vivid colours, these helped reveal the details of the engravings and also highlight the narrative of the text. Without the museum this would have been a slightly dull site to visit, however the museum did a great job of explaining the significance of the monuments. I managed to visit this site as a day trip from London, thanks mostly to Jelling's proximity to Billund Airport. From the airport you can catch a bus to either Vejle (largish town with some nice shops) or Give (small village with a lovely church and great bakery) and from both of these it is one stop on the train to Jelling. Jelling itself is little more than a village, however it does have a little brewery and you can sample their very impressive output at the museum café. In Billund I also managed to get into Legoland, I had always wanted to go there when I was a kid, and it certainly didn't disappoint, it was superb. It is free for the last two hours of the day, which was a great way to end the day trip. As said by the other posters here, Jelling is not the most astounding of sites to visit as the monuments are rather small, however the significance is well illustrated by the on site museum making this an interesting place to visit for a few hours. I live where the Runic stones are so many (Uppland, Sweden) but I have not seen a stone with text on three sides. That is unique itself. As I passed by on a Monday, the museum was closed, and I just saw the outside which wasn't very much. But, as Tanner writes, the history of Jelling is much greater than what can be seen at a visit outdoor. Visit it if you pass by or are very intersted in danish history. A Church, two Runic Stones and two big Mounds is the short summary of the Danish World Heritage Site of Jelling. But the story behind these objects is a fascinating piece of Danish as well as Scandinavian history. The two stones was carved at the time of Harald Blåtand - or maybe even by the man himself - the first Viking ruler that united the early Danish kingdom. One of the stones also contains the earliest picture of Jesus Christ. I have visited Jelling twice and its easily accessed by a local train that runs almost all the way up to the site itself. Both times I visited have been in January so I have only freezing cold memories from this little village. It’s a nice place to visit if you’re touring Denmark, preferably in the summer though…! Jelling today is a small town/village. At the edge are 2 burial mounds with a church set between them and 2 carved stones. The larger of these stones is set in a straight line to the summits of the 2 mounds and exactly half way between them. The site has particular meaning to Danes as the place where the Vikings accepted Christianity. One of the mounds is thought be (or at least legend has it) the burial place of the pagan King Gorm and the smaller of the 2 stones (not in its orginal place), in runic script, states “King Gorm made these monuments in memory of his wife Thyra, Denmark’s adornment”. The second (and central stone) states (also in rune and thought ot be inexactly the correct place) “King Harald ordered these monuments to be made after his father Gorm and his mother Thyra. It was this Harald who won for himself all Denmark and Norway and made the Danes Christians”. The stone is thought to date from around 960CE. One 1 site therefore there are runes of both Pagan and Christian Nordic culture. The church is very simple and not all orginal, but contains some murals from around 1100CE. It is a very pleasant little spot to visit. We had the place entirely to ourselves. It is also one of those places whose significance is perhaps greater and more interesting than the site itself might indicate. Many of the villages, including my own, near where I live in UK have Danish names and a few runic inscriptions have been found (eg in another WHS - Durham Cathedral). It is interesting to trace back the source of these connections. As an aside it might also be interesting to note that the Harald referred to is Harold Bluetooth. And he is the same guy after which the radio frequency standard for connecting computer devices is named (“Bluetooth”) -albeit via mor modern fiction. The Bluetooth logo merges the Viking runes for H and B (Harald Blåtand) and the technology merges telecoms and computing in analogy to Harald Bluetooth merging Norway and Denmark!! Peat: Both burial mounds consist of turf/peat. Introduction of Christianity: The runestone states ?Ring Harald bade this monument be made in memory of Corm his father and Thyra his mother, that Harald who won for himself all Denmark and Norway and made the Danes Christians? Built in the 10th century: illustrate the Christianization of the Danish people towards the middle of the 10th century. Located in a Former Capital: During 30 years in the 10th century Jelling was the capital of unified Denmark under Harald Blatand. 152 Community Members have visited.